Safe Speed Forums • View topic - Is it April 1st or are these people having a laugh? Post subject: Re: Is it April 1st or are these people having a laugh? OK, this has been bothering me for a day or two since I realised how many companies I use are in their list of supporters. I've drafted this letter which - suitably tweaked - I'm going to start sending out to companies that I would be likely to use. Also will send something similar to the Ministers of all the government departmenst they list, who might be shocked to see where public money is being directed. In the past I have regularly bought (INSERT PRODUCT HERE) from your company and fully intended to continue to do so. 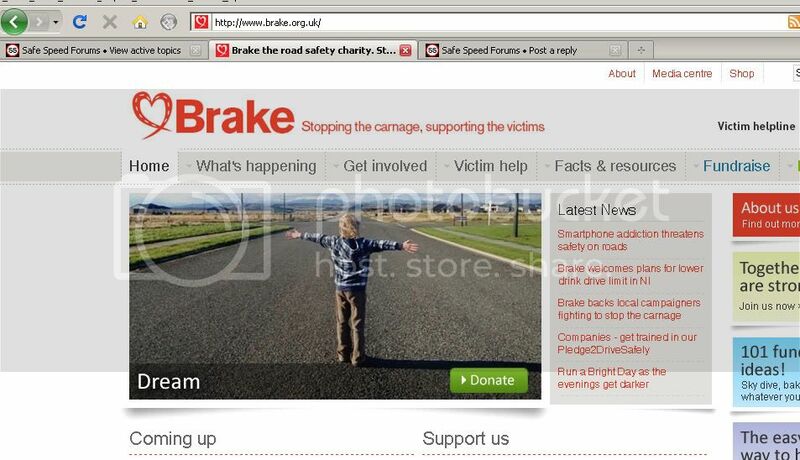 However, I read on the anti-car campaign group BRAKE’s website that you are/have been a donor to their coffers. Apologies if this is not the case, but you may wish to contact them to get your name/logo removed. BRAKE is a charity, though there is a widely-held opinion that they do not deserve this status. They appear to have been started with the best intentions to offer support to road accident victims, but seem to have been taken over by people who spend all their effort campaigning against car use, with a particular thrust being a desire to make us all drive extremely slowly, despite the fact govt stats (TRL 323) show that excessive speed only causes one accident in thirteen. BRAKE is perfectly entitled in a democracy to campaign for laws like this, but as an ordinary motorist I am not comfortable spending my money with an organisation that supports a fake charity with such sinister motives. If, before I next plan to buy (INSERT PRODUCT HERE) from you, I check their supporters list and your name is still there, I am afraid I will be going elsewhere henceforth. I will also be encouraging friends and family to do the same. I'll be checking that fakecharites link beforehand as it's currently down. In these financially austere times, I imagine that you are trying to justify every penny that the <INSERT GOVERNMENT DEPARTMENT> spends. So I was surprised to read on the anti-car campaign group BRAKE’s website that you are/have been a donor to their coffers. Apologies if this is not the case, but you may wish to contact them to get your department’s name removed, for accuracy’s sake. ....BRAKE is perfectly entitled in a democracy to campaign for laws like this, but as members of the Coalition have on several occasions referred to “ending the war on motorists”, I find it very surprising that you would have the budget going forward, and the political desire, to continue to support them with public money. I'm going to start with the government depts. That's my money, and I can't vote with my feet. ...if anyone wants to join in. Speed is a contributory factor never a 'cause'. Also you start by saying that you are going to continue to use their product yet at the end state that unless your conditions are met you won't - that is conflicting and therefore meaningless. Depending upon how much you buy will likely depend on what their level of 'concern' will be - I am afraid. If you were able to source a similar / suitable product for less money / better service/conditions etc and say this inspired you and you are now going to leave, unless they do 'X' and are prepared to loose X amount of business - then I think it would be more meaningful. Plus if it is copied CC to your MP AND to Watchdog ... as they have air time = lots of viewers = much more money AND = much more embarrassment. Wouldn't the time be better spent teaching children road safety they can put in to practice, like ped and cycle safety? Or is this just about indoctrinating the young and impressionable? Think you might find ,if you look hard enough that it's been going on for a long time .I remember my sister coming to visit us with my nephew ,way back in the late 70's .I took them to the railway station -she belted up ,as did he and next thing he said was "mummy ,why is uncle not wearing a belt".And he was not educated at a local school-but at one of the better ones ,paid for by thee & me ,as parents were posted abroad and could claim boarding school allowance . But if we teach road safety - my granddaughter has been taught it by her mum ,from an early age ,and for quite a few years now ,bike safety ,by stepdad -but the bike safety bit comes easy -she's bike( as on engined/quad) daft -so wants to learn all about them ,and stepdad starts from safety angle first . Brake: • Life bans are implemented for life-threatening and life-taking drivers. This one caught my eye. For a start what will be judged life-threatening? - As a motorcyclist I'd judge anyone who says 'SMIDSY' - and who gets to choose what is and isn't 'life-threatening'? But of more concern is how Brake would deal with the burgeoning numbers of recidivists who will not stop driving because of a ban. Though the events in 'Cops on the Box' programmes are very selective it does appear that there's no shortage of banned drivers who continue to drive. So how do they propose to deal with them (given that any notion of in-car ID checks is impractical - and even if it weren't thieves would have a get round soon enough)? Permanent incarceration? Or perhaps hobbling persistent offenders? Do BRAKE campaign to have motorcycles banned on the grounds that they are so much more "life threatening" than cars? The letter I posted is a template which I am changing then reading every time I send it. I am including my history with each company. So far bothered two govt departments and two insurance companies. Trying to work out who to annoy at RBS group who seem to be the umbrella organiser over several offenders. To be fair, about the only thing I agree with them on is more trafpol. No, but all motorcyle accidents are caused by cars or "speed". The child, standing out in the middle of a (non-residential) road, without supervision, and with perfectly good pavements either side of the road. The arrogance of the extended arms is the icing on the cake. . . . . . . . . "Dream"
People, this is what Brake want! Although that shot looks like it has been taken 'abroad', I had seen the person as an adult initially. I agree that having empty roads is hardly a reality and certainly makes me wonder how they think they are going to receive the clothes that this person is wearing, or the food to sustain them too? How are they going to get from the Port (assuming imported) to their address? Magic carpet perhaps ? Considering they try to support truckers, this seems like a complete conflict of interest. It bothers me greatly that they use relatives of those who are suffering, or have suffered road incidents, as voices for their Campaign, these people are often in great shock and are in an extremely vulnerable state. Their attempt to teach all children that cars are 'dangerous' is rather nieve and speaks of desperate measures. All vehicles might be considered dangerous if you chose to walk out in front of one, or if one was completely unaware of how one is likely to be (predictably) driven. But teaching children to be aware and how to keep themselves safe and to be very careful and sensible, will allow for a safe passage without the need for segregation. That's a place where road safety is very likely to be much worse than in the UK. Perhaps BRAKE should start there and not here. That really does sum up their idea of road safety, encouraging a young child to stand in the middle of a road, with their back to one possible flow of traffic and their hair over their face obscuring their view of oncoming traffic...well done Brake! The charity [Brake] wants the punishment for speeding increased to a £1,000 fine and six penalty points. Note the lack of "up to". If implementing fixed-penalty fines based on income is not possible, Brake would like to see a much higher fixed-penalty fine, of £1,000 for speeding. No, I think you may have misread it. As all drivers are life-threatening. life-taking demons, there's no degree of judgement necessary! The original Brake links do not work - I wonder why? Does anyone have a list of their corporate sponsors? Think Johnnytheboy had a good idea with his letter. I would be horrified if companies I use supported Brake and would look for alternatives. Some people bereaved by road crashes have generously fundraised for Brake by asking for donations instead of flowers at a funeral or memorial service. If you wish to do this and would like some words about Brake and the use of our logo for a funeral programme, please call Lisa on the details above."